Tonight Snow before 11pm, then snow, possibly mixed with freezing drizzle. Areas of fog before 5am. Temperature rising to around 18 by 4am. Northeast wind around 8 mph, with gusts as high as 18 mph. Chance of precipitation is 100%. Total nighttime ice accumulation of less than a 0.1 of an inch possible. Total nighttime snow accumulation of around 3 inches. Wednesday A slight chance of freezing drizzle between 4pm and 5pm, then a chance of snow and freezing drizzle. Patchy fog between 7am and noon. Otherwise, cloudy, with a high near 27. East northeast wind around 7 mph. Chance of precipitation is 20%. Wednesday Night Snow and freezing rain. Low around 19. East northeast wind 7 to 9 mph. Chance of precipitation is 80%. New ice accumulation of less than a 0.1 of an inch possible. 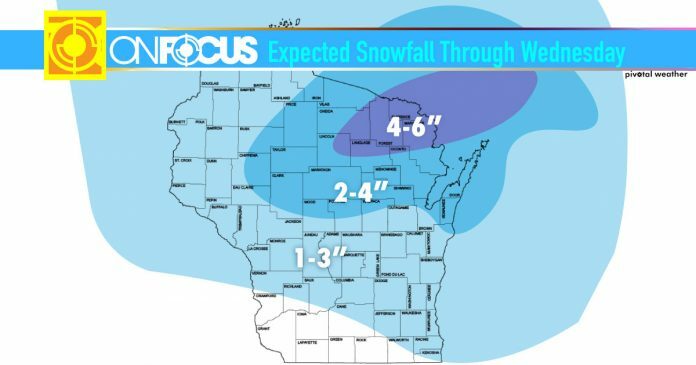 New snow accumulation of less than one inch possible.